Soulshadows II is a weekly-ish supernatural anthology series. As you all know, in early April we had the April One Week Challenge wherein participants were asked to write a 12 page dramatic script about a secret revealed at a family picnic . We had 33 entries. The fine folks over at iScript.com were kind enough to select one script out of the group to be recorded. The selected script is Of Sound Mind by Cameron Mitchell . The wealthy Hogarth clan gathers for a picnic in the woods, to be followed by a reading of the patriarch’s will. The family will never be the same. Val’s work was adapted to the stage by Merle Miller who writes, “I read this script as a screen play [on SimplyScripts] and thought it would make a great stage play… I contacted Val and got the go ahead, last month. I rewrote the script, secured a cast, and we just finished producing it (April 24, & 25, 2009) in less than 8 weeks from start to finish, at our small theatre in Laporte Indiana, and it was a big hit. Everyone was amazed at the hot air balloon scenes on stage. Some pictures and info are available at our website www.washingtonstage.org, and a Laporte Herald-Argus newspaper article on April 23, 2009. Merle Miller, Washington Stage Theatre, Laporte Indiana. Discussion board members can comment here. Merel and Suzanne Miller renovated the old Washington Elementary School in historic La Porte, Indiana. It is a community-oriented venue where aspiring actors, script writers, musicians and performers of all ages can find a venue for their work. The theatre is actively looking for submissions. You can find more information about submitting your work here. Irresponsible failure prime suspect regarding the disappearance of his best friend, suburban family man in midlife crises finds man cave, ambulance chaser face of law firm and a Susan Boyle biopic? Thanks 1987brian for the heads up on Script Shadow. Around since February of this year, Carson Reeves reads and reviews recently sold spec scripts, some of which have been mentioned on ScriptGirl. Most recently Carson has reviewed Pierre Pierre which sold for a million and is to star Jim Carrey. Other reviews include Jennifer’s Body and State of Play. The reviews for April are listed out on the site in the bottom right column below “Ongoing Top 25 Scripts (links will take you to original scripts)”. Be sure and also take a gander at script reviews done in February and March. I quite nearly overlooked them. Art dealer captures criminals in his spare time, 19th century German youths with ‘ish’, rules for dating teenage girls and brother marries sisters high school nemesis. The writers of the One Week Challenge (OWC) scripts are revealed here. Each challenger had one week to write a script. Initially, the writers real names are not shown. This makes it fun trying to determine who wrote what. 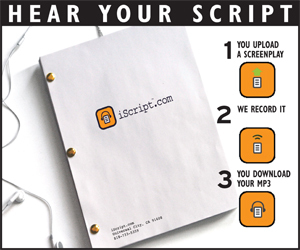 Shortly, three scripts will be selected to send over to iScript.com where they will make the final selection and audio perform the selected script. Permalink | Comments Off on The Writers Revealed! Entries (RSS) and Comments (RSS) | 64 queries. 0.195 seconds.